There’s a zebra in the cake tin! I have to admit I get obsessed with recipes. I might try something really good in a restaurant and spend the next couple of weeks trying to crack the dish, each time getting a little closer, but not happy until I get it right. It often means sleepless nights and a husband who tires of being my taster-in-chief. 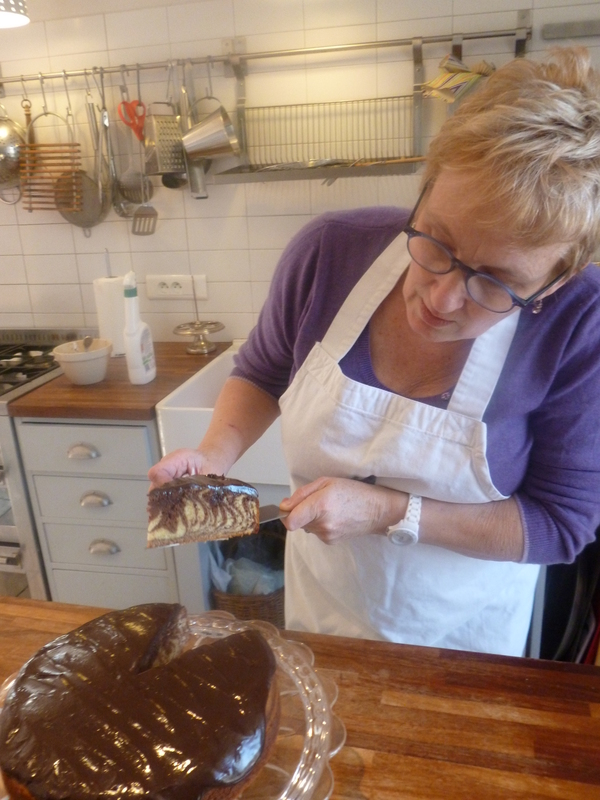 As he loves anything sweet no such complaints were heard when I decided to try my hand a making a zebra cake. 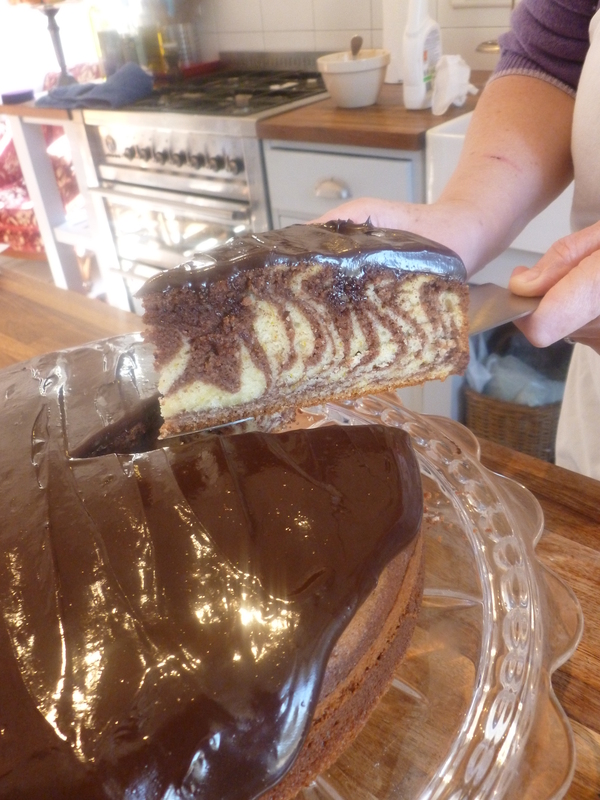 It’s a big cake that’s a bit like a marbled cake but when you cut into it you find stripes instead of swirls. Last week my good friend Reza Mahammad came for tea to talk about the cookery school he is setting up near Cognac so I had the perfect excuse to give it a go. There are loads of recipes on the internet for this cake but most are in cup measures and none explain properly how to get perfect stripes- and only perfection will do where zebra cake is concerned. The cake I made for Reza worked out just fine and tasted brilliant, but the stripes became too thick in the centre of the cake. Zebra cake number two is for my sister Deirdre who arrives tomorrow. Sitting by the river with a cup of tea and a big slice of cake is just what she needs I reckon. 1 Heat the oven to 180C/160C fan/Gas 4. Butter and line the base of a 22-23cm round cake tin with baking parchment. 2 Put the eggs and sugar in a large bowl and whisk until light and creamy, and the mixture leaves a trail which the whisk blades are lifted. Stir in the milk,oil and vanilla using the whisk blades until evenly mixed. Sift in the flour and baking powder and fold in using the whisk blades. 3 Spoon half the mixture into a separate bowl. Sift the cocoa into one bowl and stir to mix. Sift 2 tbsp flour into the other bowl, along with the orange zest and mix well. 4 Spoon 3 tbsp of the orange batter into the centre of the prepared cake tin. Allow to settle a little then spoon 3 tbsp chocolate batter carefully into the centre of the first batter. Continue in this way until half the batter is used up, then reduce the amount you add each time to 2 tbsp until all the batter is used. 5 Bake the cake for 35-45 mins, until the cake feels firm to the touch in the centre and springs back when gently pressed. Cool in the tin for 5 mins, then turn out, peel off the paper and cool on a wire rack. 6 To make the ganache finely chop the chocolate, then heat the cream gently in a small pan or the microwave. Remove from the heat and stir in the chocolate until you have a smooth glossy sauce. If the chocolate is not completely melted return to a gentle heat for a few seconds, stirring all the time. Pour into a bowl and leave to cool, stirring occasionally until it is spreadable. Spread over the top of the cake and leave to set. This entry was posted in Uncategorized and tagged cake, chocolate, Cognac, recipes, restaurant, Reza Mahammad, self raising flour, zebra cake on 28th February 2013 by marycadogan.